To Cite: Shahryar Kamrani R, Oryadi Zanjani L, Nabian M H. Arthroscopic Curettage of Intraosseous Ganglions of the Lunate Bone, Shafa Ortho J. 2014 ; 1(4):e24627. Background: Intraosseous ganglions (IOGs) of the lunate bone are a rare cause of chronic wrist pain. Traditional treatment by open curettage and bone grafting can lead to ongoing pain and stiffness of the wrist. Objectives: In this study, an arthroscopically assisted minimally invasive technique of debridement without grafting of the lunate IOG was presented. Patients and Methods: In a prospective study, eight patients with symptomatic lunate intraosseous ganglions were treated with an arthroscopically assisted curettage technique without bone grafting in seven of them. At the preoperative examination and the last follow-up, wrist flexion/extension range of motion, the Mayo Wrist Performance Score, the Quick-Disabilities of the Arm, Shoulder, and Hand (Quick-DASH) score and the visual analog scale (VAS) were calculated. At final follow-up recurrence, patients’ general satisfaction, return to work and complications were assessed. Results: The mean age of patients was 37 ± 8 years. The mean duration of symptoms and follow-up were 12 ± 4 and 28 ± 17 months, respectively. The mean pretreatment wrist flexion-extension arc of motion was 151 ± 46, and 174 ± 9 at the last follow-up, which was not significantly different (P = 0.23). All patients had statistically significant improvements in the Mayo functional wrist score (P < 0.01), Quick-DASH score (P < 0.01) and VAS score (P < 0.01). 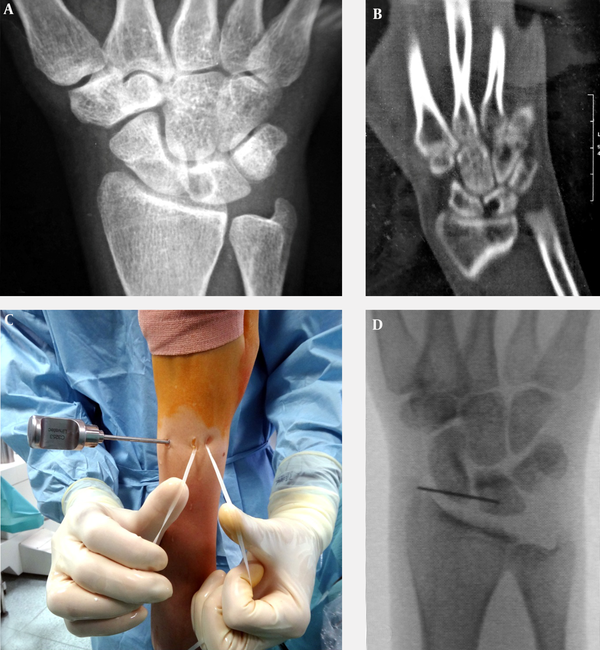 Conclusions: Arthroscopic debridement of intraosseous ganglions of the Lunate bone without bone grafting could improve wrist functional outcomes with fewer complications. Diagnosis of intraosseous ganglion (IOG) cysts is based on specific radiographic findings and histological examination (1). Intraosseous ganglions have been reported most frequently in the lower extremity especially around the hip, knee, and ankle (2). Intraosseous ganglion cyst is an infrequent cause of chronic wrist pain. It is most commonly reported in the lunate and scaphoid bones (3-6). Its differential diagnosis includes osteoid osteoma, giant cell tumor, enchondroma, osteoblastoma and the Kienbock’s disease (7). The etiology remains unknown. In symptomatic cases treatment includes open curettage with autologous or homologous bone grafting (8) resulting in a high rate (up to 40%) of persistent symptoms in previous reports (9, 10). Ashwood et al. reviewed eight cases of intraosseous ganglions of the lunate treated by arthroscopic assisted drilling and autologous bone grafting and reported promising results (11). In this prospective study, we evaluated medium-term effects of a minimally invasive arthroscopic curettage technique without bone grafting in cases with symptomatic carpal bones intraosseous ganglia. In a prospective study between February 2010 and October 2013, we treated wrist intraosseous ganglions with an arthroscopically assisted technique in eight patients (4 men and 4 women). The radiographic inclusion criterion was an eccentrically located radiolucent lesion with a thin sclerotic margin contained within and not expanding the bone (8-10) (Figure 1-A, B). The dominant limb was involved in six patients. All patients presented with chronic wrist pain in the perilunate area unresponsive to a minimum of six months conservative treatment including immobilization and non-steroidal anti-inflammation medications and not finding other sources for the pain. The medical ethics committee of the orthopedics department of our hospital approved the study. An informed consent was obtained from all patients after explaining available treatment options prior to surgery. Figure 1. A) Radiographic Inclusion Criterion Was an Eccentrically Located Radiolucent Lesion With a Thin Sclerotic Margin Contained Within and not Expanding the Bone; B) Intraosseous Ganglion Site Was Identified Preoperatively by CT Scan Imaging; C) A Trans-Four Portal Was Created Just Direct to Lunate and Tendons Were Protected With Two Pair Tapes; D) Arthroscopic Burr Site Was Confirmed Intraoperatively by Fluoroscopic Images. The patient was followed up at 3 and 12 weeks and 6 months. At preoperative examination and the last follow-up, following assessments were conducted. The wrist flexion/extension range of motion was measured by a goniometer. All patients were assessed with the Mayo Wrist Performance Score, the Quick-Disabilities of the Arm, Shoulder, and Hand (Quick-DASH) score and the visual analog scale (VAS). At the final follow-up recurrence, patients’ general satisfaction, return to work and complications were assessed. Patients were assessed postoperatively by radiography to assess intralesional trabeculation at the same time of their clinical evaluation. The procedure was performed in supine position under general anesthesia using a tourniquet. The arm was suspended with Chinese finger traps and the elbow flexed to 90° with the wrist in a vertical traction 4.5 kg. We used a 2.4-mm arthroscope with a visual angle of 30° and a wet technique with normal saline solution provided through the arthroscope cannula. Initial diagnostic wrist arthroscopy was performed via standard 3/4 and 6R portals and intra-articular findings were documented. Lunate and intraosseous ganglion sites were identified preoperatively by radiography and CT scan imaging, which were later confirmed intraoperative by arthroscopic land marks (scapholunate ligament) and fluoroscopic images. For lunate intraosseous ganglions, a trans-four portal was created just direct to lunate. The tendons were protected with two pair tapes (Figure 1-C). The exact site of the cyst was marked by a pin and confirmed under C-arm fluoroscopy (A A 3-mm sheath-less burr was introduced trough trans-four portal toward the cyst and it was destroyed by rotating motion of the burr without bone grafting. Finally, arthroscopy was used to inspect the hole, the joint was irrigated and the wounds were sutured with absorbable sutures. One patient (case No. 7) asked us for filling the defect with autogenous bone graft. In this patient, we harvested cancellous bone graft from iliac crest and inserted it to the excised ganglion trough trans-four cannula. No splinting was used postoperatively. Wrist range of motion began on the first postoperative day. The patient was followed up at 3 and 12 weeks and 6 months. Statistical analysis was performed by SPSS software, version 18.0 (Statistical Product and Service Solutions, SPSS Inc., Chicago, IL, USA). Data was presented as the mean ± standard deviation. Paired T-test was used to compare quantitative variables before and after the operation. P < 0.05 was considered statistically significant. We treated eight cases; four patients were housekeepers, two were laborers and two were surgeons. Seven patients participated in follow-up. The mean age of observed patients was 37 ± 8 years (ranged 29-48 years). The mean duration of symptoms was 12 ± 4 months (ranged 7-18 months). The mean duration of follow-up was 28 ± 17 months (ranged 9-51 months). The mean wrist flexion-extension arc of motion pretreatment was 151 ± 46, and the last follow-up was 174 ± 9, which was not significantly different (P = 0.23) (Table 1). aAbbreviations: DASH, disabilities of the arm, shoulder, and hand; Preop, preoperative; VAS, visual analog scale. bMissing data due to lack of patients’ cooperation. According to the Mayo functional wrist scores, there were four excellent, two good and one satisfactory result at the final follow-up. All patients had statistically significant improvements in the Mayo functional wrist score (P < 0.01), the Quick-DASH score (P < 0.01) and VAS score (P < 0.01). Details are presented in Table 2.
aAbbreviations: DASH, disabilities of the arm, shoulder, and hand; VAS, visual analog scale. There were no minor or major complications regarding arthroscopic procedure except transient superficial ulnar nerve paresthesia in one patients. None of patients experienced recurrence or underwent another operation. All patients were satisfied with the operation result. Two patients including one who underwent bone grafting complained about mild discomfort and residual pain differing in nature with the previous pain. All patients returned to their previous occupation and achieved normal function. At final follow-up, radiographic analysis showed no sign of collapse, fracture or recurrence in lunate area. However, trabeculation within the intraosseous lesion was evident in one patient who had bone graft and partial trabeculation in two other ones (Figure 2). A, Complete Trabeculation Within Intraosseous Ganglion (Case No.7); B, Partial Trabeculation (Case No.6). “Intraosseous Ganglion” (IOG) term was first used in 1966 by Crabbe to describe synonymous terms including synovial bone cyst, juxta-articular bone cyst, ganglionic cystic defect of bone and subchondral bone cyst (12). It can be distinguished from other common differential diagnoses of carpal bone lytic lesions using imaging modalities including radiography, CT scan and bone scan (7). IOG cyst might be completely asymptomatic or clinically manifested by chronic pain unresponsive to analgesic medications. This pain could result from intraosseous hyper pressure secondary to pathologic process development within an inextensible limited cavity which based the treatment philosophy (13). Surgery is indicated in case of symptoms affecting function resistant to conservative treatment after at least six months with no other recognized sources of pain or in the presence of radiographic progressive signs (9, 14). Currently, the treatment preference is intralesional curettage of the IOG cyst associated with autologous bone grafting to prevent any recurrence and the risk of bone collapsing and fracture (9, 10, 13). However, previous studies with open curettage and bone grafting procedures have involved heterogeneous and unpredictable outcomes and high complication rates (2, 9, 10, 15). In 2003, Ashwood suggested a new technique in arthroscopically assisted treatment of IOG of the Lunate in eight cases. They reported six good or excellent wrist functional results and two fair results with fewer complications using drilling and autologous bone grafting. They proposed that improved results with arthroscopic technique could be due to less arthrofibrosis because of minor damages to ligamentous structures using a small incision (11). Curettage of the cyst and packing with cancellous bone graft were performed in most reported cases to minimize the risk of recurrence, bone collapsing and fracture (9, 10). However, the technique of bone grafting involves operative harvest from a donor site having several complications, including painful scar, infection, hematoma, fracture, and gait disturbances (16). Therefore, several investigators proposed treatment of benign bone tumors by simple curettage without bone grafts and reported promising results (17-20). In the current study, using a minimally invasive arthroscopic excision technique without bone grafting, most patients had eventual relief of symptoms and pain with four excellent, two good and one satisfactory wrist Mayo function result. There were no recurrences, complications or reoperation at a mean of 2-year follow-up. At the final follow-up, one patient (case No. 7) showed trabeculation at the site of previous IOG and partial trabeculation was evident in two other patients, but there was no evidence of recurrence or bone collapse in radiographic analysis of all patients. Two of our patients complained residual pain around the portals. This study had some limitations. The follow-up time was short. They were limited cases. It was not practical to evaluate our patients histologically to confirm the diagnosis due to insufficient sampling during arthroscopic method. We could not compare the effect of bone graft, but we found that bone graft is not necessary for satisfactory results at least in medium follow up. According to the results of our study, arthroscopic debridement of intraosseous ganglions of the carpal bones without bone grafting could improve functional outcomes with less potential complications. Authors’ Contributions: Study concept and design: Reza Shahryar Kamrani; Analysis and interpretation of data: Reza Shahryar Kamrani, Leila Oryadi Zanjani and Mohammad Hosein Nabian; Drafting of the manuscript: Leila Oryadi Zanjani and Mohammad Hosein Nabian; Critical revision of the manuscript for important intellectual content: Reza Shahryar Kamrani, Leila Oryadi Zanjani and Mohammad Hosein Nabian; Statistical analysis: Leila Oryadi Zanjani and Mohammad Hosein Nabian; Study supervision: Reza Shahryar Kamrani.